Plates courtesy of April Whitt. 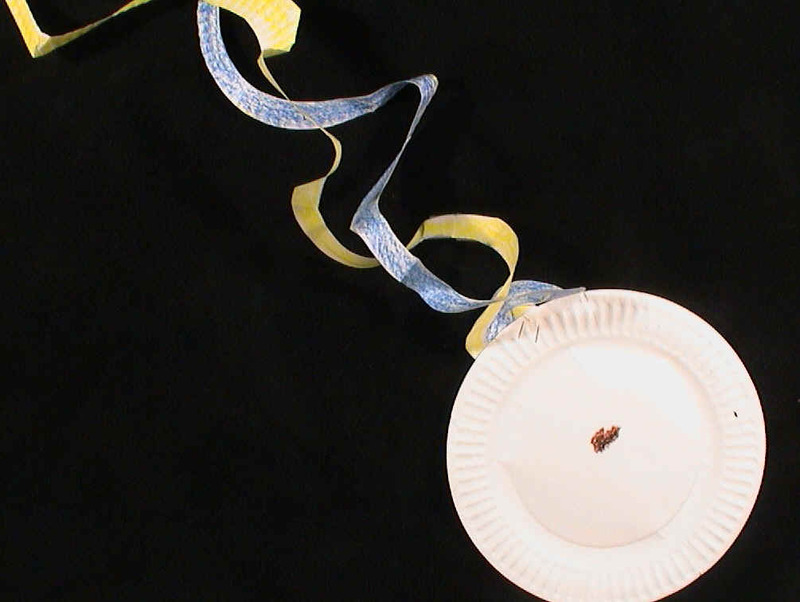 Give each team one half of a paper plate that is folded over so it looks like a quarter plate. Each team opens their half-plate to see the name of the planet they're supposed to depict. 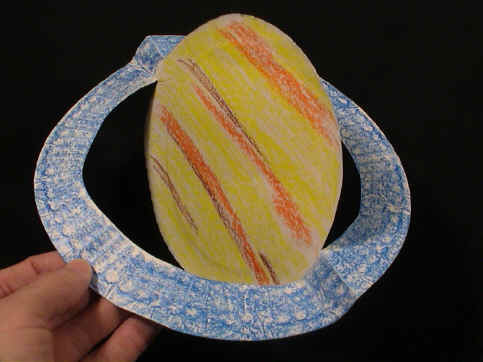 Each team then colors a paper plate front and back to look like their planet. Provide some posters or images of planets they can refer to as well (real color, not false color). The ringed planets have rings cut into them. Comets are two plates: one plate whole with a nucleus and the other plate cut in a double spiral for the tail (yellow dust tail and blue gas tail). Discuss with students their existing knowledge or convictions about the planets and concepts like rotation, poles, equator, revolution/year length. Take the students outside with planet plates in hand. Establish a scale by creating a story. For example, suggest a cosmic giant can step from the sun to the earth in one step (1 A.U.). Pace off the planet distances from the sun with each team of students, starting with Pluto and leaving the teacher back with the other students. As each team reaches its distance from the sun, the students stop, turn to face the sun and hold their planet plate up high. Note how far apart the outer solar system planets really are (or, conversely, how close the inner ones are), and why it takes spacecraft so long to get from one to the next. Comets are last. They start at the very outer edges of the solar system, race toward the sun as their tails lengthen, and hurtle back out again. GLPA Proceedings, 1999, p. 36. 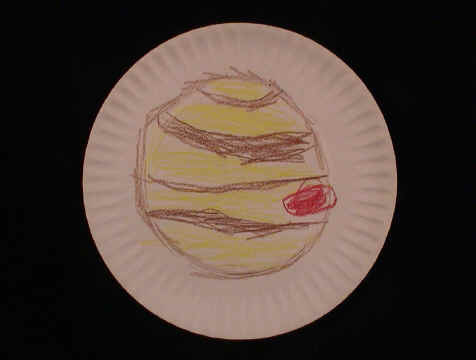 For more pictures of children constructing plates see the Dynamic Planets picture gallery. Multiple websites that offer scale models of the solar system are listed at http://www.vendian.org/mncharity/dir3/solarsystem. For example, one website that allows you to establish your own reference size for a scale model of the Solar System can be found at http://www.exploratorium.edu/ronh/solar_system/. For example, if the earth were a paper plate (about 9 inches, or 228 mm) the rest of the system would be scaled as shown on the sample table below. The diameter of the sun would be equivalent to 983 inches, or about 109 paper plates placed end to end. A standard-sized package of paper plates contains 100 pieces. From that large sun, the plate-sized earth would be in orbit over 8,802 feet away. Some values on the table below have been rounded off for simplicity.